I knit these for my brother while sitting by his bedside at the Vancouver General Hospital. 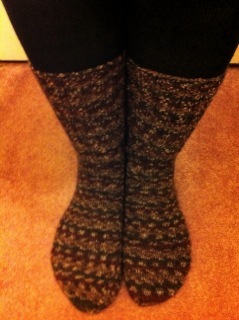 I did not try to make the pattern on each foot aligned but was happily surprised when I saw the photo of them. The yarn is a new small line that we brought in. I thought they would be great for men. Subtle colors of brown, blue or green as a base. There was alot left over so I also knit a little sample, a coffee sleeve, and I still have some left! You will have to ask which one it is at the shop because I did not bring the label with me to Vancouver. Wow, those are really awesome socks. Those must've taken you forever to knit but that's just from my point of veiw because whenever I see someone knitting my brain has a massive fart at how much patience it must take and i leave the room quickly. Love the name of your blog. Very catchy!